Jeanie Grene is an American soul and gospel singer. Mary Elizabeth Johnson was born in Corinth, Mississippi in 1943. She released a few obscure singles as Jeanie Johnson whilst still a teenager in the late 50s, which were produced by Chet Atkins. In the mid 60s she recorded at Quin Ivy's Norala studio in northern Alabama (best known for Percy Sledge's "When a Man Loves A Woman") under the name Jeanie Fortune, but again with no success. It was here that she met and married musician Marlin Greene, and began to find steady work as a backing singer, first at Norala and then at Chips Moman's American Sound Studio in Memphis. She also released a one-off single with her fellow backing singers under the name Southern Comfort in 1970. In the early 70s she was signed to Elektra Records, along with a number of other southern musicians (including Lonnie Mack, Don Nix and Mickey Newbury). She worked closely with Don Nix, appearing on his solo albums and albums he produced for other artists, and going on tour as members of The Alabama State Troupers. They also both appeared at George Harrison's Concert For Bangladesh, as members of the backing choir. Nix produced her one and only solo album in 1971, which was recorded at the Muscle Shoals Sound Studio. It had a rootsy southern soul / gospel sound, with Greene's strong voice and piano front and centre. The gospel elements were to the fore, with religious themes to most of the songs. It had a very similar sound to Nix's own solo records from the same year. 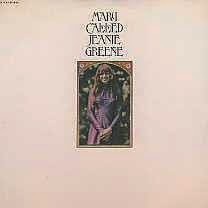 Little has been heard of Jeanie Greene since. She continued to work as a backing singer, but never released another solo album.